I Can’t Believe We’re Talking About Conscious Conception! Since I was six years old I’ve been dreaming of being a mom. I remember so many times over the years when I’ve thought about ‘teachable moments’ that I can’t wait to share with a child of my own. It might sound strange to you, but I’ve been preparing for motherhood most of my life. From gathering innumerable birth stories, to getting educated in Prenatal Birth Preparation, to learning everything I have about fertility – conscious conception has been on my mind for a long time. 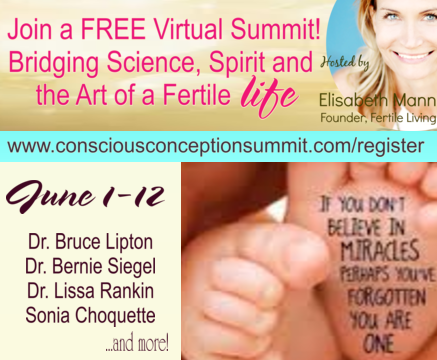 So you can imagine my surprise and excitement when I was invited to speak at a virtual summit ALL ABOUT conscious conception! My wonderful new friend Elisabeth Manning, Founder of Fertile Living and author of Secret Life of Fertility, has brought together amazing speakers like Bernie Siegel, Bruce Lipton, Lissa Rankin and Sonia Choquette to name just a few, as well as TOP fertility experts (like ME!) to guide you towards consciously conceiving. “The Conscious Conception Summit: Bridging Science, Spirit and the Art of a Fertile Life to Birth Your Divine Potential” is totally virtual and FREE to attend! Together we will explore the scientific and spiritual aspects of conceiving to help you discover and clear any possible hidden fertility blocks you may be holding on to. Powerful Meditation Practices to support you on your fertility journey. The fact that we’re even talking about conscious conception is a dream-come-true for me. I hope you’ll join us for this life-changing event.